Warm as late winter has treated us throughout the Mid-Atlantic, no need to rush spring. For that matter, even when dandelions have sprouted, I would recommend purchasing them rather than harvesting your own. For one thing, dandelions in the wild are likely to flower before you know it. And once they’ve flowered, the greens get plenty bitter. However, the commercially grown variety is peak right now and has been since the beginning of the year. I can’t imagine dandelion greens more attractive in both appearance and taste than the organic ones being sold by Whole Foods Market. Just as with calf's brains, for which one of James Beard's recipes immediately precedes this posting, public consumption for dandelion greens has diminished. Neither James Peterson’s Vegetables nor Annie Somerville’s Fields of Greens even mentions them. Since James Beard’s American Cookery had numerous recipes for calf’s brains, it seemed reasonable it might also have recipes for dandelion greens. It did, two recipes, both for salads. More tempting, however, was a Pennsylvanis Dutch style salad recipe in Elizabeth Schneider’s Unusual Fruits and Vegetables: A Common Sense Guide. Interestingly, Ms. Schneider's source was Felipe Rojas-Lombardi, who authored the definitive Art of South American Cooking. 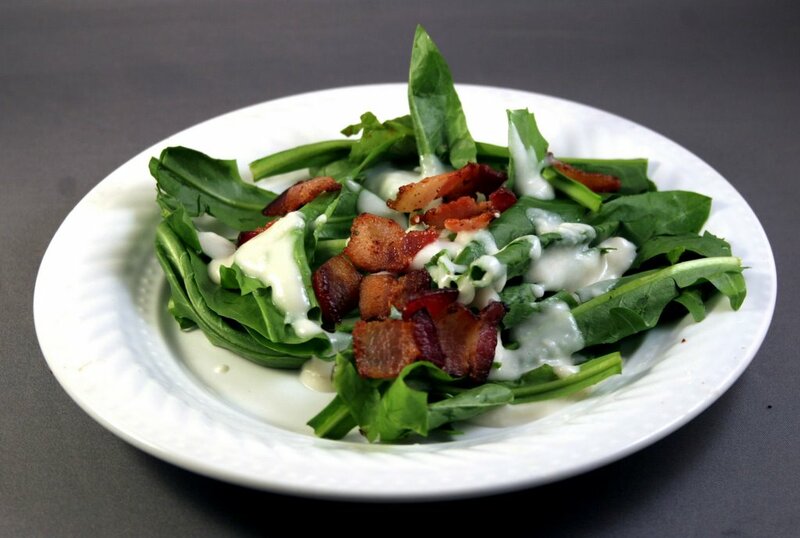 What makes Rojaas-Lombardi's recipe exceptional is the marriage between ultra-crisp fresh greens and bacon---of the best possible quality---along with a dressing that is fatty, creamy, and warm, yet subtle. Dry dandelions thoroughly. Wrap in a towel and chill thoroughly. Fry bacon in skillet until crisp and browned; transfer to paper towels to drain. Discard all but 3 tablespoons bacon fat; strain the fat to remove all solid bits. Heat fat in small saucepan; add flour, stirring over low heat for several minutes. Add milk and continue stirring over low heat for a few minutes longer. Add ¼ cup vinegar and 1 ½ teaspoons sugar and stir for a moment; adjust to desired pouring consistency by adding vinegar to taste. Taste for sugar, salt, and pepper. Set aside. Arrange chilled greens on 6 plates. Heat dressing, thinning, if necessary. Pour over greens; sprinkle with bacon and serve immediately. Elizabeth Schneider: Uncommon Fruits and Vegetables: A Common Sense Guide, Harper and Row: 1986.